September, October and November prove to be the driest months with the best temperatures in the Grand Strand, so it’s no wonder that many local and out-of-town brides plan fall weddings in Myrtle Beach and the surrounding areas. Yummy seasonal flavors like apple, pumpkin, pecans and caramel inspire a lot of at-home bakers to get in the kitchen, and we get just as excited about the creativity in baking that seems to flow out of that special feeling that autumn brings. We love consulting with brides to learn about their fall wedding vision and working out each detail to ensure that it becomes a reality. Those brides who are looking for something more traditional can still make a statement with cake tiers that have been decorated with beautiful flowers and berries in deep autumn hues. Interestingly, several of today’s trending wedding cakes and desserts also pair perfectly with a fall backdrop. A “naked cake” is easily recognized by its absent or minimal outer layer of frosting. The look was once only seen by bakers as a “crumb coat” before the final layer of frosting was added, but it is now a hot trend especially in the wedding industry. Naked cakes bring a rustic texture by letting the actual cake color blend into the design which make it a great choice for the many brides seeking a “rustic elegance” theme. Cake flavors are most often white or yellow, although you can certainly get creative with flavors in fall. We talked about planning the perfect wedding dessert bar in a recent blog post, and you can have a lot of fun with this trend in the autumn. 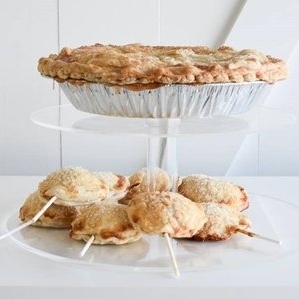 We’re finding that fall brides are typically booking dessert bars with a variety of pies and cake truffles. Desserts can be customized in any number of ways to suit your color scheme or wedding theme, and you can get creative with the way that they are displayed. Metallics are a great way to go because they can adapt to pretty much any style, and they bring a sense of glamour to an autumn palette. There are so many ways to incorporate the look from edible gold leaves to a metallic drip that cascades down the cakes tiers or even fine edible glitter (think pixie dust) that can give a decorative sheen to your cake without overpowering the whole design. Planning a fall Myrtle Beach wedding? We would love to help you share your love story with a delicious cake or dessert bar! Pink Pineapple Cakes is located in Surfside Beach, and our team is equipped to deliver to most Grand Strand locations. We are open by appointment only. Please call us today at 843-712-1757 to schedule a complimentary consultation.